The NetAcquire architecture includes distributed time synchronization capability. When data is collected from many points on a network, it is often important to accurately correlate time stamps of incoming data. NetAcquire uses configurable time sources to maintain a highly accurate and synchronized clock. Two network time protocols are supported for distributed time synchronization: Simple Network Time Protocol (SNTP) and Precision Time Protocol (IEEE 1588 PTP). Each protocol uses a reference server to distribute accurate time across the network to one or more clients. The time protocol incorporates sophisticated algorithms to eliminate the effects of network delay and jitter. all nodes are synchronized to an internal IEEE 1588 PTP time standard. The timing drift of each local NetAcquire clock is computed in real-time. If the network time server machine becomes unavailable, this local drift is used to continue making corrections to the clock until time server connectivity is restored. The timing offset and drift parameters are also stored in non-volatile memory to protect against power failures. The NetAcquire time server is also useful for time-synchronizing other network machines, such as Windows PCs and UNIX workstations. 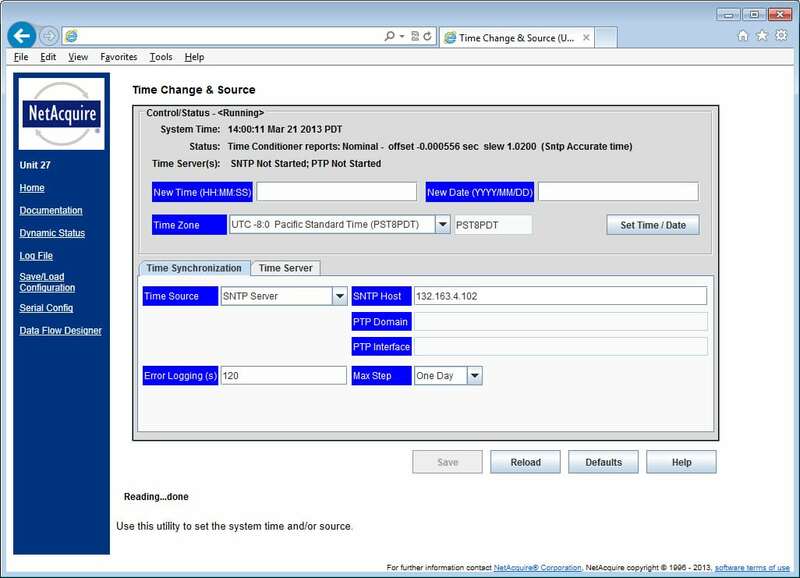 Time services are available on all NetAcquire platforms, and NetAcquire Web administration pages are used to activate time server and time client capability (screenshot).